We’ve had quite the mild, if colder than usual, winter— so far. However, it’s still early January and Old Man Winter is clearly still trying to make a fashionably late entrance. Now is the time to prepare for when the temps stay around –or below– freezing for long stretches of days. If you don’t, you may just get to discover the costly fun that is burst frozen pipes in your house. Start by identifying pipes that are at the greatest risk: outdoor spouts and any pipes that run along exterior walls. Exposed pipes are relatively easy to deal with: shut the water off to outside spouts, and wrap insulation or heat tape around exposed pipes. But if pipes are inside walls and not properly insulated, you need to take some extra steps. 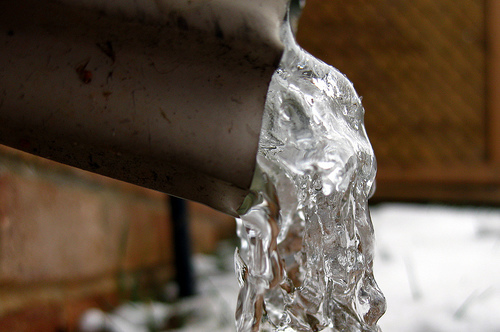 DC Water recommends taking the following steps to reduce the risk of pipes in your home freezing or breaking. – Eliminate sources of cold air near pipes by sealing drafty windows and doors, and insulating walls and attics. – If pipes are exposed to cold air, wrap them with insulation or even newspaper will help. – Keep water moving through pipes by turning on the faucet farthest from your main valve to a very small, steady trickle. – Run warm water through your pipes if you begin to see a decrease in water pressure to loosen any ice that may be forming within your pipes. – Keep pipes in cabinets and vanities warmer by opening the doors to those cabinets to let warm air in. If you find you have a frozen pipe, you should immediately take steps to thaw the pipe to keep it from bursting. – First, locate and shut off the main water supply valve in case a pipe has broken. – Next, open the faucet so that water will flow through the pipe once the area is melted. This will help melt more ice. – Then, gently apply heat with a hair dryer around the pipe. Keep all sources of heat away from flammable materials and do not use any open flame devices. Also, do not use devices that will cause the melted ice to boil, as that can also cause pipes to break. – Call a licensed plumber if you cannot locate the frozen section, if you are unable to reach it, or if you are unable to thaw it. – Check for other frozen pipes in your home or business, especially those pipes that are located along an exterior wall or bring the water into the building at the foundation. – Once you have thawed the frozen area, check the pipes for leaks to make sure the ice did not cause any cracks or damage to your pipes. – The service line that runs from the meter outside your home to your indoor plumbing is considered private property and is the owner’s responsibility. If you believe you have a problem on the private-side service line, please contact a licensed and registered plumber. – The water mains that carry water to service lines are highly pressurized and fast moving, and therefore extremely unlikely to ever freeze. For emergency service inside your home, contact a licensed plumber. Call the DC Water 24-hour emergency line at (202) 612-3400 for water emergencies on public property, including suspected water main breaks, especially if you see water running from a building into public property.